For a long time people have tried to re-imagine Ocarina of Time in 2D and you can see a couple of game projects online dedicated to just that purpose. 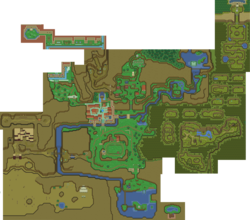 Zelda Fan Game Central community member MaJoRa has managed to recreate the entire overworld of Ocarina of Time into a 2D Link to the Past style. MaJoRa announced the project was complete on Friday, having started the project back in June of 2010, but MaJoRa seems to have more plans for this project, having said the following and asking for as much constructive criticism as possible. You can view the project in all of its entirety right here.